Our flight arrived quite late so we decided to stay in Chicago and do some shopping the morning after before returning home. We stayed at the Hyatt Lodge at McDonald’s campus using a free night from the Chase World of Hyatt card. The paid rates for this hotel, especially on the weekends, are quite reasonable. The hotel is located in the Chicago suburb of Oak Brook on the campus of McDonald’s Headquarters. There are plenty of restaurants and shopping opportunities close by. My first impression of the hotel was that it had a beautiful forest setting and it took advantage of this with a somewhat rustic, natural motif that fit the setting perfectly. They also had some artwork that was pretty interesting reflecting the fact that it was on the McDonald’s campus. Parking is free and spacious just down from the drop-off area. After checking in, we embarked upon the exceptionally long trek to our room. The hotel is arranged in a very linear pattern with the lobby at one end so you can have very long walks to get to rooms. I was considering hiring a sherpa to get back to the lobby to check out. There were some weddings just finishing up while we were checking in so there was plenty of activity going on even at the late hour. We were not disturbed by the weddings at all and did not hear any noise from the hallway. We were in king standard room which I would describe as a standard conference room hotel. There was a balcony with a nice view of a forest, but only had enough room to stand. Nothing in the room really stood out as exceptional but it was perfectly functional. In terms of on-hotel amenities, the hotel has an amazing fitness center and pool area. I did not get a chance to use the gym but it looked very well appointed with cardio equipment, weight machines and free weights. The huge pool was probably the most stunning aspect of the hotel. There were windows surrounding the pool with forest views and skylights that let in plenty of light and made the space feel especially airy. There was also a sauna in the locker room. This area was somewhat hidden and it was another long walk down twisting hallways to find it. There is also a restaurant with beautiful views across the pond. We did not eat at the hotel however so I cannot comment on the quality of the food. The hotel also can provide you with a map of the campus with routes for running or walking. 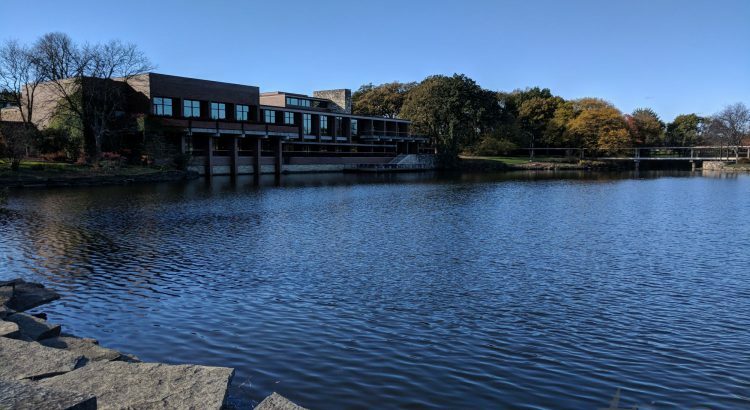 We took a (chilly) walk in the morning through the very lush, green campus past water features, statues, and sites like the main headquarters and Hamburger University. Overall the hotel exceeded my expectations. The McDonald’s headquarters campus provides a beautiful backdrop for the hotel and the pool really sets the hotel apart. I think it would make an excellent base for both couples and families for a Chicago trip or a staycation in any season.